Get your own share in the trending geode pieces of exquisite jewellery. The purple quartz, Lusaka amethyst, is just that, offering you a transcending violet colour with speckles of red and indigo! Find a wowing collection with plenty of designs, only at TJC! Boasting a dazzling violet-purple hue and shine that blinds the admirers, Lusaka amethyst is for the lovers of exquisite jewellery! Coming from the quartz family, this stone sings variation of colours with different intensities, ranging from premium-to-dark purple and faint violet tones with a transparent sparkle. 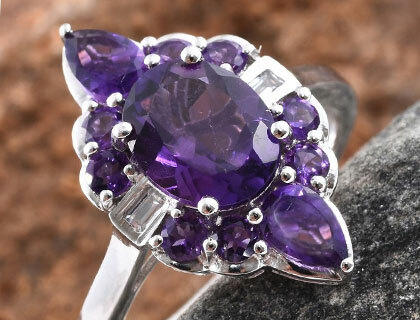 What makes the amethyst from Lusaka better than the others is the intense colour property. Boasting some exquisite shades of deep purple to light, faint lavender, the variation found in colours is something that makes them prized as well. In some of these amethysts, fine speckles of red and indigo can also be seen, which makes the appeal of the stone even more luring.Named after the capital of Republic of Zambia, Lusaka amethyst is found in surplus amounts at the said place. Also termed as Zambian amethyst, this stone is highly priced and revered for its brilliant colour and lustre. Other places where you find high-quality amethyst are Brazil, Uruguay, and South America. However, it should be noted that the supply of amethyst from Zambia is six times higher than the supply from South America. In regards of the term “amethyst,” it comes from the Greek word “amesthustos” for sober. It was thought that the wearer of the stone would not get inebriated. Some people in the history claimed that if you were to drink from the goblet made out of amethyst, one wouldn’t get drunk at all. The special and peculiar trait of amethyst found in Lusaka is that they’re small in their extractions. It means that only small and low-carat jewels of this kind are found adorning the jewellery. The best quality of the stone is also found in Zambia, in South Africa. The best stones present a unique, pleocroism, which means that they show different colours when viewed from different angles. What makes the amethyst from Lusaka better than the others is the intense colour property. Boasting some exquisite shades of deep purple to light, faint lavender, the variation found in colours is something that makes them prized as well. In some of these amethysts, fine speckles of red and indigo can also be seen, which makes the appeal of the stone even more luring. This stone is considered to be crystal quartz with high lustre. Proficient faceting can bring an alluring lull its appeal. The pieces procured from Lusaka are smaller than the ones found in other places, but they have an unmatched colour intensity and purity, which makes me pricey and rare. There have been a number of legends and stories related with this godly stone. Like any other crystal that allows light to completely pass through, Lusaka amethyst is widely used by many astrologers and healers for cleaning rituals. It is believed that it brings purity and positivity in the lives of the wearer. It is also claimed by some healers to draw out anxiety and the feeling of despondence by keeping the stone close. Amethysts have been considered as pious stones by several healers since a very long time. Several believed that it controls evil thoughts, abstains addictions, aids aspirers in victory, and other such positive effects. Many still believe it to ward off evil. It is also said that the stone encourages calm, bravery along with guarding the wearer against anger of passion and violence. We’ve all read in length about the importance of birthstones and amethyst is one of them. Known as the birthstone of the month February, it holds tremendous importance and luck for wearers born in the month, or so several astrologers claim. It was one of the twelve stones spotted on the breastplate of high priest. Amethyst ranks 7 on the Mohs scale of hardness, which is just a rank lower than diamonds. That doesn’t mean that it is immune to damage on the surface. You need to take care of your jewellery as it is susceptible to scratches and external abrasions that might tarnish its glitter. If you need to clean it, you may put it in a bowl full of warm water with a few drops of dish soap. Use a soft-bristled toothbrush if you must, to clean the bottom side of the stone. Rinse it with cool water and wipe the water with chamois cloth or any other soft towel. Lusaka amethyst comes from the quartz family. The colour variation of the stone travels from light lilac to the rich and intense tones of purple. It is considered to be the birthstone of the month February and astrologers claim that it brings good luck to the wearers. It is also a traditional gift for the 6th and 33rd anniversaries. Many legends in the history claim that it assists in prophecies and visions. Feng Shui still says that keeping the stone enhances the wealth corner and provides the wearer with riches. Some relics of the past say that the stone helps in the healing of several ailments and illnesses. In Chinese medicinal ways, many people still wear amethysts to cure stomach pains and bad dreams.